The Login function on the site is only for the administration. Please do not register for this site. The Troop site website is the site you need to register for your gymnast account. Soon we will be updating the websites to make them more user friendly for everyone. Look for all the great changes soon!! Thanks, your PR department. · There are a lot of Crazy Gym Parents (CGP) out there...do NOT fall into their trap! Be there to support your kids...be there to support your kids' teammates. Gymnastics is one of the few sports that you win as a team and an individual. The better each gymnast does, the better the team does. Please encourage good sportsmanship and cheer for all gymnasts. Do NOT bad mouth another team, coach or judge. The gymnastics world is small and everyone knows everyone. · You need to be at the meet 30 minutes prior to the start of the check in time and ALWAYS plan extra time for travelling (GPS does not always give you the fastest way). · Make sure you have the phone number of someone on your child's team's level. It is helpful if you get stuck in traffic or lost. Keeps the panic mode away for everyone! o Girls should arrive at meet in Warm Ups, wearing Competition Leo, hair in a high tight bun. NO fingernail or toe Polish, No jewelry, No excessive makeup, No temporary tattoos. We will have a hair clinic as the season gets closer. o We have several styles of adult shirts for anyone else who wants to show their Diamondback pride. · Pack healthy, mess free, high energy snacks and water or color-less Gatorade for gymnasts in their bags (for spectators, concessions very rarely has anything healthy). · Once the meet schedule is published you should leave that weekend/day open for just Gymnastics. The registrar will publish the session times as soon as she has them, but they can often change. 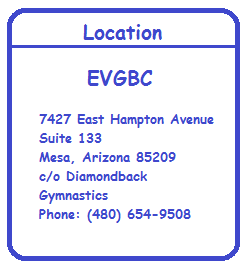 To stay informed make sure that EVGBC has your email, that you are a member of our Facebook group and keep your liaison’s phone number handy. · Meets are LONG!! Boy’s meets can go upward of 6 hours. Girls at levels 3-5 are heavily attended and may be 4-5 hours long. Be prepared. The seats may not be comfortable. Bring a stadium cushion. There is a lot of waiting in between events that will test the patience of many younger siblings. · Boy’s competition format is different than the girls. You will sit there, bored, for two hours while they warm up every event before they even start to compete. Then, they will move with lightning speed from event to event and it will be over before you know it. Be prepared with your cameras when the competing starts. · Take lots of photos and videos; just make sure that your flash is OFF!! You do not want to be the one that causes a child to get hurt doing a skill because they were blinded by your flash or be asked to leave the event. · If you child needs special equipment (beam shoes, grips, braces, tape, gauze, sticky buns, etc) talk to your coach and get the specifics BEFORE you order. Not all equipment is made with the same quality and some items have competition restrictions. Your coaches can help you with the best match for your child. · All the board members are volunteers. Please be kind and helpful. This is a Team Sport, including parents. If everyone shares in the work and effort then everyone can enjoy their time with their Gymnast and family more. Valid XHTML | Valid CSS | Copyright © 2013. All Rights Reserved.